It is easy to read the spare text of the Gospel of Mark through the details elaborated in the subsequent Gospels of Matthew, John and Luke. If we can isolate Mark’s text from these others, however, and try to read it as if for the first time, looking for interpretations that are bound exclusively within its own pages and without any reference to other gospels (after all, if it was the first gospel then we need strong arguments to justify reading it through the eyes of later gospels), a very unorthodox gospel emerges. One example, I think, is Mark’s treatment of Pilate. 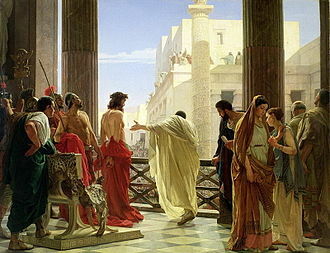 The popular image of Pilate, derived largely from the later gospels and apocryphal works, is that Pilate was pressured against his will and better judgment to authorize the crucifixion of Jesus. But that’s not what I think I actually read in the Gospel of Mark. The umbrella impression most Christians have re the Passion narrative includes the detail that it was the custom for the Roman governor to release a prisoner at Passover time. This is a reasonable conclusion, but it does not come from Mark’s gospel. In the gospel of John the reader is informed that it was a Jewish or state custom. Luke’s gospel carries on the idea that it was apparently a state custom. Mark’s gospel, however, where the story began, says this “custom” was really a personal custom of Pilate alone. It reminds one of the ability for which many Roman potentates were renowned (and by which means they often climbed the ladder to more power), the ability to please crowds. Matthew, the first to copy Mark, more or less adhered to Mark’s narrative on this point, although he impersonalized Mark’s personal pronoun reference to Pilate to the generic “governor”. Then we come to Pilate’s threefold approach to the crowd asking them if he really wants him to crucify Jesus or someone else. In the gospels of Matthew, John and Luke, Pilate’s inner struggle is conveyed clearly enough. 1. The governor answered and said unto them, Whether of the twain will ye that I release unto you? They said, Barabbas. 2. Pilate saith unto them, What shall I do then with Jesus which is called Christ? They all say unto him, Let him be crucified. 3. And the governor said, Why, what evil hath he done? But they cried out the more, saying, Let him be crucified. Then answered all the people, and said, His blood be on us, and on our children. Then released he Barabbas unto them: and when he had scourged Jesus, he delivered him to be crucified. Thus Pilate finally succumbs because the crowd “made a tumult” that he could not resist. It might be noteworthy, furthermore, that Pilate did not act until after the crowd insisted that they alone took the responsibility of the blood of Jesus upon themselves and their future generations, completely (in their own minds at least) exonerating Pilate. Matthew’s account might well be interpreted as an early attempt to inject a lethal dose of anti-semitism into the gospel story. Poor Pilate, pressured by his own judgement, his wife’s dream, and the crowd’s “tumult”, finally caved in. John’s gospel likewise has Pilate making a threefold appeal to the crowd to release Jesus. The first two times Pilate was attempting to make it clear to the crowd that he judged Jesus to be innocent. The third time, however, Pilate was in real fearful earnest. On hearing that he might be a Son of God, Pilate’s heart was fully behind his words in seeking Jesus’s release. But then the Jews “cheated” by blackmailing him with a lie. He would be guilty of treason if he did not crucify Jesus, they threatened. 1. And when he had said this, he went out again unto the Jews, and saith unto them, I find in him no fault at all. . . . Will ye therefore that I release unto you the King of the Jews? Then cried they all again, saying, Not this man, but Barabbas. . . .
Then Pilate therefore took Jesus, and scourged him. . . .
2. Pilate therefore went forth again, and saith unto them, Behold, I bring him forth to you, that ye may know that I find no fault in him. . . . And Pilate saith unto them, Behold the man! When the chief priests therefore and officers saw him, they cried out, saying, Crucify him, crucify him. When Pilate therefore heard that saying, he was the more afraid; . . . . When Pilate therefore heard that saying, he brought Jesus forth, and sat down in the judgment seat . . . .
3. and he saith unto the Jews, Behold your King! But they cried out, Away with him, away with him, crucify him. Pilate saith unto them, Shall I crucify your King? The chief priest answered, We have no king but Caesar. Luke’s gospel likewise portrays a threefold effort on Pilate’s part to release Jesus, and also explicitly states that Pilate was “willing” (link to online Greek lexicon)/wanting/determined to release Jesus. 2. Pilate therefore, willing to release Jesus, spake again to them. But they cried, saying, Crucify him, crucify him. 3. And he said unto them the third time, Why, what evil hath he done? I have found no cause of death in him: . . . . And they were instant with loud voices, requiring that he might be crucified. And the voices of them and of the chief priests prevailed. Or desiring to please the crowd? With the Gospel of Mark, on the other hand, if we can read it apart from the above, we see something altogether different, I think. The mere fact of a threefold effort or act is so common throughout literature, biblical, folk, ancient, modern, that it cannot of itself inform us of the intent of a character. Peter’s threefold denial in the gospel is a sign of the totality of Peter’s failure. Why not consider the possibility of the same meaning behind Pilate’s threefold approach to the crowd? A passage in Mark’s gospel, omitted from subsequent gospels, explains that Pilate knew that the chief priests charged Jesus with a capital crime because they envied him. So in Mark’s gospel Pilate not only judges Jesus to be innocent, but even sees through the motives of those wanting him dead. Pilate acts in the full knowledge of both Jesus’ innocence and the criminal motive of his enemies. This makes Pilate guilty at more than one level. He is not merely pressured against his desire to save an innocent man; he is cynically folding to the whims of evildoers. What excuse can Pilate have for even taking the case of Jesus to the mob if he knew that the Jewish leaders were toying with both him and the crowd out of sheer envy? Pilate certainly gives the mob a chance to release Jesus. He calls on them to give him a reason to crucify him. They don’t. No matter, Pilate chooses to “please the mob”. If later gospels said Pilate wanted to release Jesus, the first gospel said Pilate wanted to please the crowd. Pilate in Mark’s gospel was a typical Roman potentate who knew how to please crowds with bread and circuses. The lives, let alone just deserts, of those who were at stake to entertain Roman crowds meant nothing. 1. But Pilate answered them, saying, Will ye that I release unto you the King of the Jews? 2. And Pilate answered and said again unto them, What will ye then that I shall do unto him whom ye call the King of the Jews? And they cried out again, Crucify him. 3. Then Pilate said unto them, Why, what evil hath he done? And they cried out the more exceedingly, Crucify him. There is none of the pressure on Pilate in Mark’s gospel that we are used to reading in the later gospels. No disturbing dreams, no hand-washing, no fear of a riot, no lying blackmail, no loud shouts that hurt his ears. The only places we read of these, along with an explicit desire or willingness to release Jesus, are in the gospels of Matthew, Luke and John. They are alien to Mark. Mark’s gospel, in fact, defiantly stands in opposition to those who build on it when it explicitly says that Pilate’s desire was not to release Jesus but to please the mob, and that without any hint of pressure to do so. Is the reader meant to think “bread and circuses”? Mark Goodacre’s blog had a recent discussion on the origins of the interpretation that the Roman who stands against the cross of Christ does not utter a Christian confession (Truly, this man was a Son of God!) so much as a scoffing taunt (So this was a son of god? Yeah right!). The details can be read from an article online by Earl Johnson Jr., Mark 15,39 and the So-Called Confession of the Roman Centurion. An earlier article of Johnson’s discussing the technicalities of the grammar is not freely available, but a summary of the main point is included in this online article. This interpretation of the Roman centurion makes sense. All that he sees as he stands “opposite” Jesus (another significant image that has negative associations elsewhere too), according to Mark’s gospel, is the dying sound of Jesus and his last breath. Pilate is later very surprised to hear that Jesus has died so quickly, and relies on the centurion’s observation to confirm this report. That one who was supposedly reputed to be a son of a deity should die so quickly was cause for a hardened Roman centurion to scoff at the claim. Only in Matthew and Luke does the centurion witness the miraculous portents surrounding the death of Jesus, thus enabling him to respond “in faith”. In Mark, he merely witnesses yet one more death, only quicker than most. Mark’s gospel portrays Jews and gentiles as equally culpable at the crucifixion. Jesus in Mark’s gospel has no friends in his last hours. Jews have turned against him, disciples have betrayed, deserted and denied him, women who once served him now stand afar off, and gentiles too, from the representative of the empire down to the centurion at the cross, toy with him as a “crowd-pleaser” and mock him. This picture only changed after subsequent gospel authors opted to single out the Jews for principal blame. This meant, of course, incipient exoneration of gentiles, beginning with a well-meaning but weak-willed Pilate (like Peter?) and a Roman being the first to confess the true identity of Jesus at the critical hour.